A highlight of Father’s Day was spending a leisurely afternoon with the family, watching the U.S. Open Golf Tournament and spending time on the deck. The visitors were many on this overcast day, including numerous butterflies and hummingbirds that gathered nectar from the flowering containers. 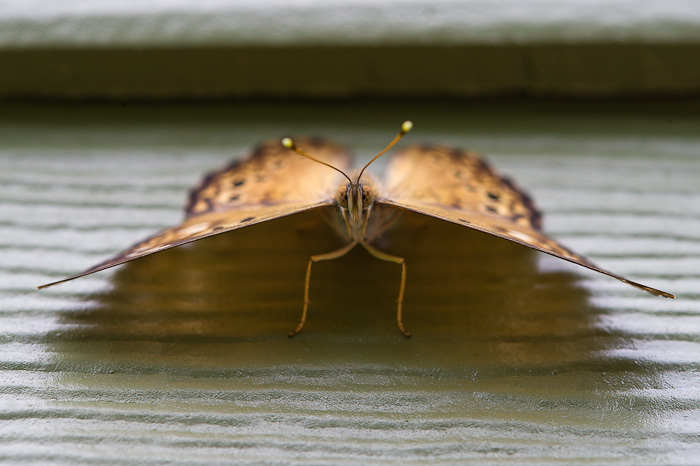 One butterfly took a moment to rest on the side of the house, face down. It waited patiently while I set up a chair to stand on, changed my camera settings and carefully approached. I’m not sure if it was the same individual who posed for me earlier in the week, but if so it could have enjoyed its moment in the spotlight and returned for another session.